Hosting a mini golf tournament is a great fundraiser for school clubs, youth sports teams, church groups, and cheerleading squads. It’s great fun and done right, a mini golf fundraiser can raise considerable funds. You will need to arrange a place to play and that’s best done well in advance. Seasonal factors will affect price and availability, but most of the time you can arrange either a flat payment for exclusive facility use or a per game fee that’s substantially lower than standard rates. To maximize attendance, price your golf event tickets at reasonable prices. Offer attractive variations like a flat-rate family ticket or discounts for students or advance purchases. Once you have a date booked, you will need to publicize your event. To get the word out, put together a press release and get it the major media outlets in your market. Keep the focus on the most newsworthy aspect of your mini golf tournament, such as why you are raising funds and what the ultimate benefit of your golf fundraiser will be. For example, if you are raising funds to help a specific person with medical expenses, feature that person’s story in the press release. If you are raising funds for a cause, focus your story angle on the positive effect those dollars will provide. And don’t forget to use posters in store windows, community newsletters, email, and other methods to stimulate interest in you golf tournament. One way to raise funds is to get local businesses to sponsor a hole. Keep the prices reasonable, such as $25 to $75 per hole. Sponsors would get signs acknowledging their contribution beside each putting tee. Think like a business person and encourage sponsors to offer something creative that will bring them customers such as two-for-one coupon given to all players. Or, a business could offer a prize to everyone who beats a certain score or gets a hole in one on the 18th hole. Besides sponsorships, you can also ask businesses to donate items or services to use as prizes for lowest score, best bank shot, etc. There are lots of activities you can include at your mini golf tournament to raise funds. Your group can sell raffle tickets for a donated prize or, lacking a suitable prize, conduct a 50/50 cash raffle where the winning ticket gets half the raffle sales amount. Food and drink sales is another source of potential profits. With course owner permission, you could even run your own concession stand offering grilled hot dogs, hamburgers, sodas, etc. You can also offer silent auctions of donated goods and services. Place the items along with attractive descriptions and bid sheets on tables near high-traffic spots. Be sure to tape down paper and pens to make it easy for players to get in a quick bid while still holding their putter. And don’t forget to ask for donations. You can oftentimes raise a considerable amount just by placing a jug labeled donations right next to where players pay for their rounds. 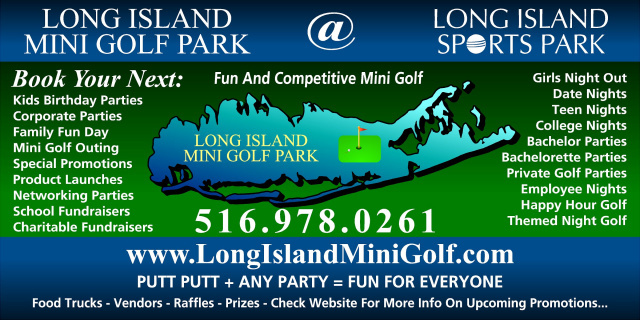 A mini golf fundraiser is fantastic fun and can be a very profitable event if done right. Maximize your turnout through getting plenty of advance publicity. Employ multiple fundraising activities to generate additional funds. Conduct raffles and silent auctions or run your own concession stand. Offer prizes for low scores or conduct a hole-in-one contest. Make your event as much fun as possible and you’ll be surprised at how well you do with your mini golf fundraiser! FUNDRAISERS! KIDS BIRTHDAY PARTIES! NETWORK PARTIES!